A very colorful "magical dream catcher" with amethyst stones. This dream catcher is stunning and a favorite of many of our customers. This magical dream catcher is detailed with pig split hide, and glass and ceramic beads. It has an amethyst point, hackle feathers and very special magical colored fiber. The webbing is made of colored sinew. The black Dream Catcher is pictured. The color difference is in the leather wrapped around the hoop only. 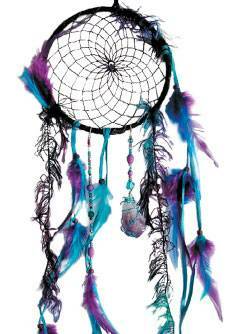 Each dream catcher comes with similar feathers, webbing and style. Overall hanging length: Approximately 22-24"